Rear width: 20 3/4 in. Good engineering can make a fireplace grate a valuable addition to your wood burning fireplace. The cast iron construction of this log grate keeps your wood burning by retaining heat, and enhances quick lighting in the first place by holding the wood four inches high for excellent airflow. You won't have to worry about this one piece, heavy duty grate becoming damaged with use, and the 24 inch width is perfect for even larger fireplaces. Do you carry any grates similar to G800 series 24" with 6" high legs? No, we do not have one in that style with that height. I would suggest looking at the Pilgrim Seven-Bar Steel Fireplace Grate - 6 Inch Clearance. What is the depth measurement from the inside of the front leg to the inside of the back leg? According to the manufacturer, the width between the legs is going to be 22" in the front and 18.5" in the back. What is the clearance underneath this unit? Per the manufacturer, this item has 4 inches of clearance to the underside of the basket. Where is this grate manufactured? Hy-C Company is located and manufacturers their products in St. Louis, Missouri. I purchased your grate and have used it now several times. Not only is it extra heavy duty but I am finding that my fires are burning much more efficient. The size (width and depth) is absolutely perfect and large enough to place a nice size back log. I take pride in my fire building skills and literally melted the center of my last fireplace grate which was only two years old. Not a chance with this grate. Also, the legs are a part of the casting and just as solid. If you are looking for a great grate deal look no further. You found it. I burn between 1.5 and 2 cords of hardwood each season and often the fire is burning for 12 hours per day. Previous baskets I have purchased locally have lasted no more than 2 or 3 seasons before I burn right through them. The basket also seemed heavier than previous ones and I am hopeful that this one will last more than 2 or 3 years. This cast iron grate was exactly what I had been looking for. My house is nearly 80 years old and had the original grate. The grate was so old it had lost several of its spokes (if that's what they are called). I wanted to replace it with a similar grate. Very pleased. This was a gift for my husband, who is the "keeper of the fire" at our house. We love having wood fires but lately had put off enjoying them because the grate we had, while sturdy, allowed partially-burned wood to fall through to the fireplace floor, basically wasting them. There was a lot of stoking and rearranging involved and it just didn't seem worth it. Enter the G800 series grate, which lives up to every positive review I read about it. Super strong cast iron, there's no chance of warping or burning through (unless less expensive grates we've had) and the flat bottom design allows the right air flow but keeps the wood pieces where they belong. The result? Longer-burning fires that require a LOT less maintenance throughout. My husband absolutely loves it. What a great purchase! ProsVery strong cast iron, design is ideal for maximizing burn efficiency. ConsDelivery charge was almost as much as the sale price, but given the weight of the item, I guess that's too be expected. I have been looking for a heavy duty grate due to past experiences with big box store grates purchased. I was skeptical buying online, I took the gamble and it paid off! This grate is exactly what I was looking for in a heavy duty grate. I love my new grate! I had been looking for a couple of years for a fireplace grate with longer legs to permit greater air flow. I found what I needed here! The grate was well-designed and the site was easy to navigate and order from. The efireplacestore kept me apprised of the status of my order and it arrived on time as planned. I love my new grate - here just in time to enjoy a nice fire on chilly New England evenings! It is the best grate I have owned. It keeps the embers on the grate for complete burning rather than falling to the bottom of the fireplace. We purchased the G800 series after our older one started melting and bending out of shape. This grate is super strong and heavy and I think it will last a lifetime. The flat bottom and space will hold several logs in my super big fireplace. would buy again. Love this grate. It fit perfectly in our fireplace and it does a great job of allowing air flow from under the grate. It's very solid and I'm sure it will hold up really well to the many fires we burn. Great design... heavy duty... very, very pleased with this grate. We have had several fires using this grate and feel that it will last for many years to come. My Husband's Favorite Christmas Gift!!! We have had the worst luck with fireplace grates. They melted after one use or didn't last for more than a few fires. This one is holding up beautifully!! 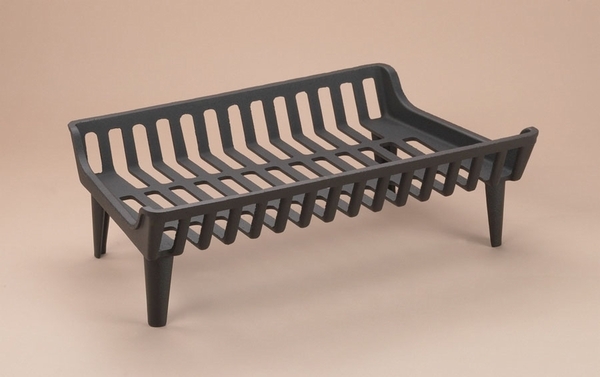 I would absolutely recommend it to anyone looking for a well-made, long lasting fireplace grate. The home I bought 12 years ago had a more porous grate and literally wasted do much wood. This grate although more expensive than others actually saves money by burning wood more efficiently. I have an outdoor fireplace on a covered porch that is exposed to temp extremes, humidity, and when lighting a fire on a frigid night, the grate encounters serious temp extremes. This grate is ideal, well constructed and heavy duty. ProsSolid, well-made, good platform structure to keep logs and embers in place and working to keep the fire going. Much better than the big-box store versions with half a dozen ribs that logs rest on. And it came in just the size I needed. ConsNothing. It was all good. From the extremely fast shipping to the top notch quality of the craftsmanship that designed this product, this item is an all around success. It is just what our fireplace needed.